Need some sun, peace and quiet??... then this is the place for you. Come visit Casa Peach and Quiet. 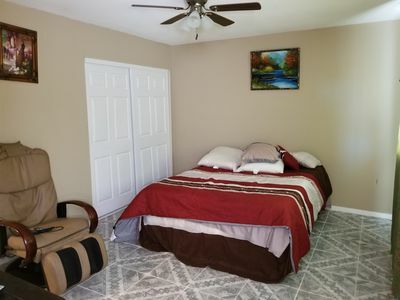 A great get away from it all, located in a quiet and safe neighborhood with friendly neighbors. Please see the map- the house is located within Menifee city which was part of Sun City just north of Temecula, but is not within the official Sun City development. Please note this is a 55 or older community and we do require proof of age for all guests in order to comply with the association rules. 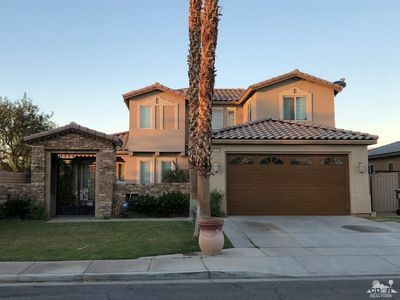 Many of the locals enjoy walking through the neighborhood, taking in the beautiful views of the mountains, various gardens and palm trees in the neighborhood. Many other recreational activities are not too far away. See below. 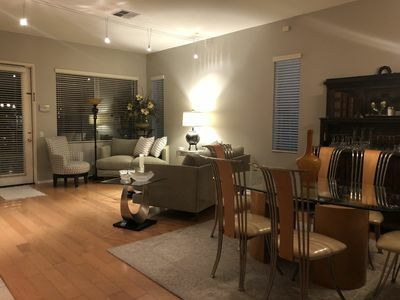 The house is a very comfortably furnished, one story, Spanish style home, with 2 comfortable bedrooms and an open living/dining room floor plan. The kitchen is well equipped. 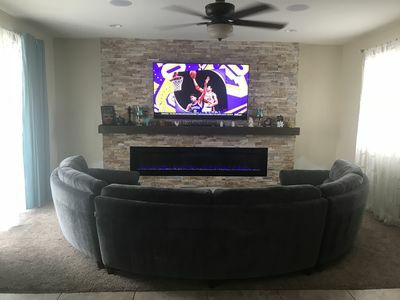 The house is set up for 4 guests. Due to allergies, no pets. 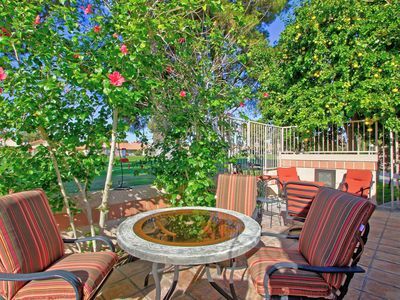 This community has all you need, from medical care, to shopping, to entertainment. There are lots of things to do! Pamper yourself at Local Spas: Spas include several within 1-2 miles from the house such as Newport Tan and Day Spa, Premier Laser and Day Spa, Quantum Fitness & Spa, Happy Nails & Spa, & Beauty By Bee. 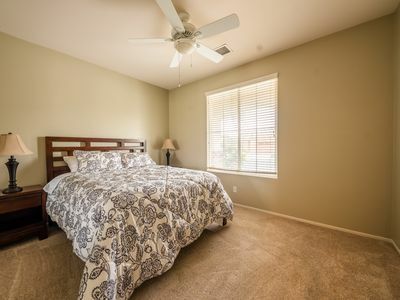 There are many more to choose from in Temecula which is approximately 15 minutes south. Pechanga (see Casino below) has a great spa as well as South Coast Winery and Resort. Do a round of Golf: Wonderful golf courses are less than a mile away! Consider California Golf & Art Country Club (see map) or within 2 miles, the Menifee Lakes Country Club or Sun City Golf Course. 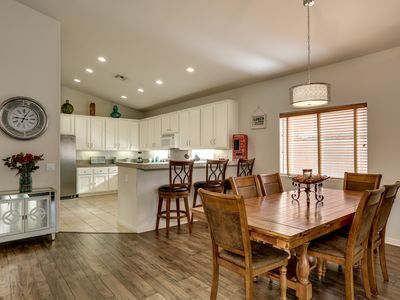 Within 4-5 miles, the Highland Palm Golf Course or Quail Valley Country Club or Canyon Lake Country Club. Go Wine Tasting! Within 10-20 mile range, there are many great wineries to choose from, such as Camden Vineyards, Thornton Winery, Ponte Family Estate Winery, Falkner Winery, French Valley Vineyards, Callaway Vineyard & Winery, Maurice Car’rie Winery and Hart Winery, Baily Vineyard & Winery, South Coast Winery to name a few. Have fun at the local Casinos: Lake Elsinore Resort & Casino is 7.5 miles away and Pechanga Resort & Casino is 18 miles away. Both have great gaming, entertainment and restaurants. Farmer’s Market. The local farmers market is in 2 locations in Temecula. The Saturday one is from 8:00 am to 12:30 in “Old Town” Temecula. The Wednesday market is from 9:00 am to 1:00 pm on the west side of the Promenade Mall. Hot Air Balloons There is a Hot Air Balloon festival the first week of June in Temecula. More than 50 colorful balloons take off from the grassy fields of Lake Skinner Regional Park. 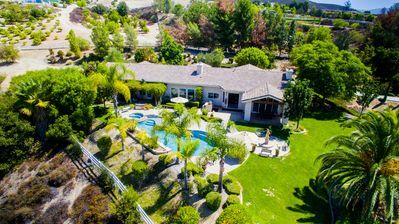 As well you can take your own hot air balloon ride throughout the year over the beautiful wine country by professional companies located in Temecula. See the map where California Dreamin is marked and provides hot air balloon rides and Biplane adventures. Shopping: Sun City has a good sized mall named Sun City Shopping Center. There is also a nearby Target. Lake Elsinore has an outlet mall. Temecula has a large mall named the Promenade Mall, with major department stores such as Macy’s, Sears, and many other well known specialty shops. Outdoor activities. There are many walking areas and several parks and lakes in the area, such as Lake Elsinore. 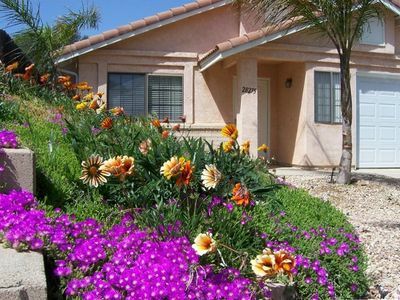 San Diego is approximately 45 minutes to 1 hour south of Sun City- Menifee. Disneyland is approximately 1.5 hours north West, considering traffic. 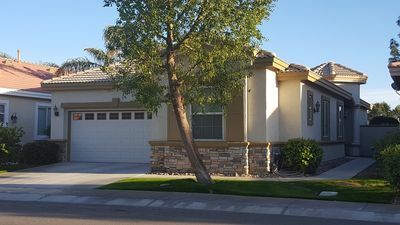 History: Sun City is a master-planned community for senior citizens over age 55. Along with neighboring communities of Quail Valley, it was incorporated as the City of Menifee on October 1, 2008. 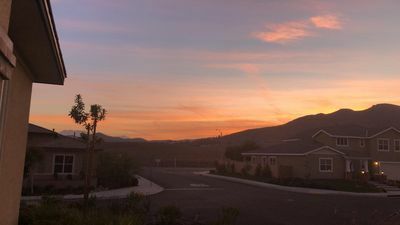 The area was originally inhabited by the Luiseno and Pechanga Indian tribes, and in the 1700s, the area fell under the rule of the Spanish empire. The area was eventually annexed into the United States from Mexico in 1850 under California's statehood. FOR FRAUD PROTECTION - do not book through anyone other than Tom or Carol Hunter- please see our picture. Anyone else trying to book you into our home is not a legitimate person or booking. Unfortunately people are being scammed by others posing to be middle men. 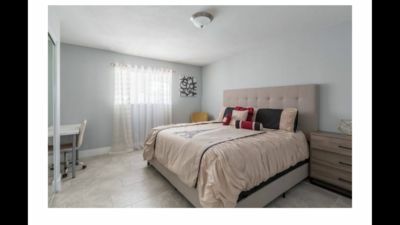 We book direct through VRBO. The Perfect Place to spend your vacation! 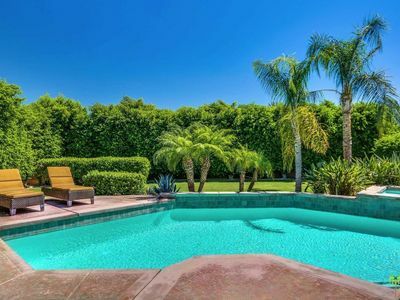 This Beautiful Estate is Walking 'Yes' Walkingto the Coachella Music festival. 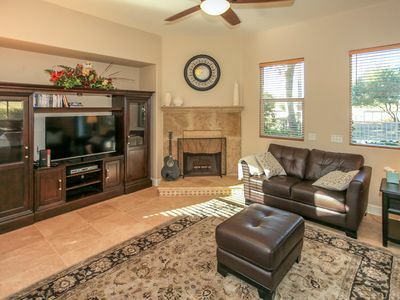 Coachella Valley Home Rental for Coachella or Stagecoach! 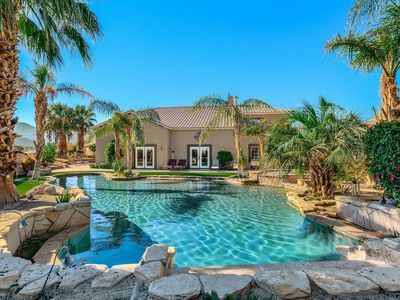 Two Story Home Coachella-Stagecoach. 5 minutes away. Group/Family Friendly. 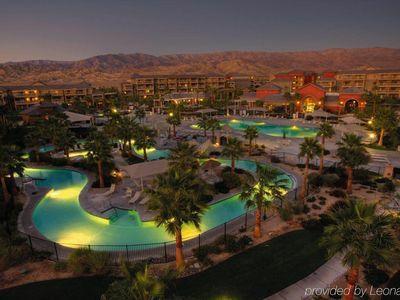 Worldmark Indio Festival Last Minute pricing! 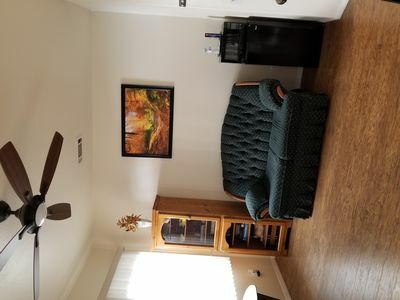 2BR/2BA King, 2Twins,Queen Murphy!